The Mission of the Institute is to support the Hoshindo lineage endeavors in the classical study of East Asia Healing Arts with training and apprenticeship in Hoshindo Japanese Meridian Apitherapy, toward the goal of its students becoming professional healthcare providers. Hoshindo presents a unique scientific system in modern healthcare based on traditional practices in Japan and the Americas. The HHAI is the first private institute of its specialties and kind in the West. It provides a special niche within the field of East Asian Medicine in the Americas. Graduates will become the recipients of a rare healthcare approach that is perfectly formatted to fit in with other independent complementary practices in both Eastern and Western Medicine. The Institute provides a cultural immersion in the ancient healing and fine arts of East Asia. This creates a grounding for the Practitioner in Hoshindo as Guardians and Keepers of the Medicines of the Bee while learning Japanese Meridian Apitherapy. The study of Hoshin weaves together a rich and colorful tapestry of energetic quantum fields theory combined with ancient systems of healing with the Medicines of the Bee and the traditional practices of East Asian healing arts. These concepts in tandem with learning the precise application of bio-tapping with the stinger of the Honey Bee on specific meridians linked with the practice of beekeeping, are crucial stages in becoming competent in this healing art. Basic concepts of Homeopathy are taught. Fanning out stagnation, and learning to heal with sacred sound are other aspects of the Hoshindo system of holistic well-being. The Hoshin student will have the opportunity to practice Reiki and other Bioenergetics while learning to use the medicinal products of the Honey Bee and certain botanicals for healing and maintaining a healthy lifestyle. Students will learn about the use of therapeutic grade essential oils and hydosols and their applications to support Hoshin therapy. The Hoshin student goes through a sequential training to become a beekeeper under the tutelage of Voyce Sensei. 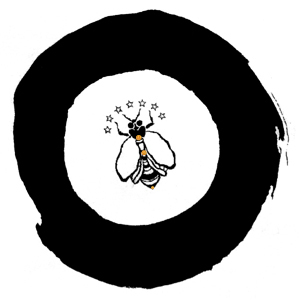 Following certain Biodynamic principles developed by Rudolph Steiner and Organic Top Bar Beekeeping taught by Les Crowder aligned with the East Asia concept of nature and spirituality taught by Voyce Sensei in Hoshindo - the Way of the Bee, the Hoshin student learns the importance of Bee Ecology. Each student will be responsible for maintaining one beehive for their practice. By experiencing the four seasons and the care-taking of the hives that is required during a full year, the student becomes a competent beekeeper. As Guardians and Keepers of the Bee, students will be taught not only organic beekeeping and the professional techniques of Japanese Meridian Therapy but will move into a unique experience of healing. Within the folds of Hoshindo the student will discover layers of esoteric knowledge from Japan and the Americas ultimately leading to profound composure and fearless mind in working with the unique medicines of the bee. The purpose of these additional studies is to focus attention on what is before one, thereby creating a listening attitude that permits tenderness to manifest within the Hoshindo Practitioner. This special curriculum will include: Zensho - Japanese Calligraphy; Healing with Sacred Sound, Crystalline Energy and Fanning techniques with the Southern Healing Fan from the Americas. To complete this repertoire the student will practice meditation and follow the ceremonial Path of Hoshindo. Hoshindo training will commence again in late 2020.